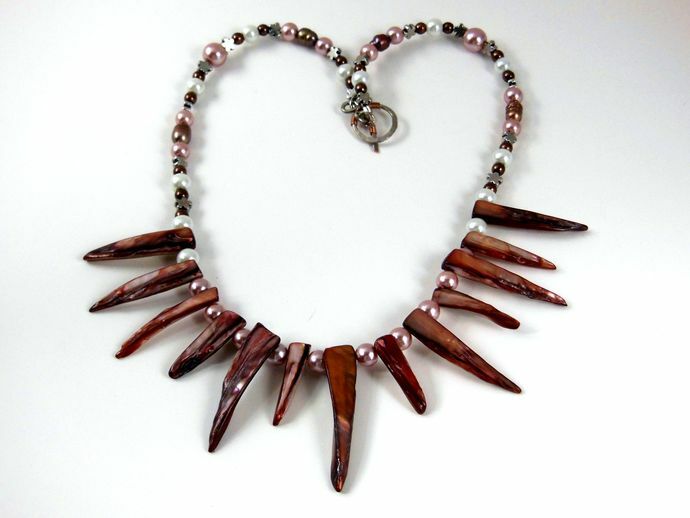 I used tooth-shaped, marsala red, iridescent, mother of pearl shell beads as the focus of this statement necklace. 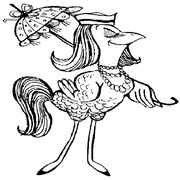 They are accompanied by similarly-colored freshwater pearls; pink, white, chocolate-brown, and copper-brown glass pearls; and star-shaped silver spacer beads. All the beads are strung onto clear-colored, plastic cord. I made a toggle clasp made from heavy-duty silver-colored copper wire; a bit of the copper color peeks through the ends of the wire and goes well with the rest of the necklace. The clasp is attached using silver jump rings. The spiky shell beads give this bib necklace a tribal feel, in my opinion, but the pearls make it elegant and feminine.